The quote nicely demonstrates Aaisaheb vision in looking at life and significance of Education on grass root of society. Aaisaheb as I use to fondly call her, was a legendary personality with strong desire of uplifting society through empowerment by education. 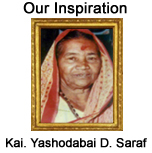 Born and bought in a common family, Aaisaheb laid this vision of serving humanity through this pious means of Technical Education. Today, we feel cheered and soulful to have Her dream come true project going live in effect and serving grass root of Khandesh region with principles laid down. This strength and desire of quality technical education has posted our Institution amongst the rapidly growing Institutions in the North Maharashtra region.